For the past year, visitors to Beijing Capital International Airport have strolled past an exhibit of photographs featuring pastoral scenes of Loudoun County. 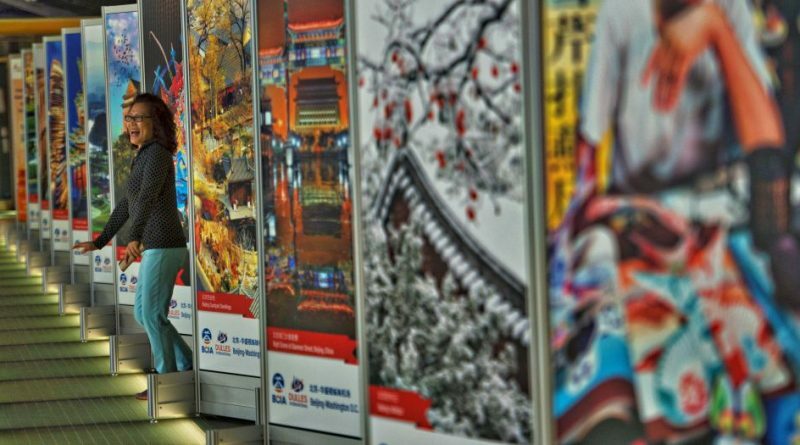 Now, passengers walking through Dulles Airport’s main terminal will get to take in visuals of Beijing. Today, leaders from Loudoun County and Metropolitan Washington Airports Authority welcomed a delegation from China to unveil a photo exhibit featuring iconic scenes from Beijing. Jerome Davis, MWAA’s executive vice president and County Chairwoman Phyllis J. Randall (D-At Large) joined Vice President of Beijing Capital International Airport Du Qiang at an unveiling ceremony this morning. They said the photo exhibits are a symbol of the strong relationship between the U.S. and China, especially as it comes to its tourism. Randall, who traveled with Davis to Beijing to unveil the Loudoun County photos last May, said the images have already sparked an interest among Chinese travelers. Last May, Dulles Airport also signed a sister airport agreement with the Beijing Capital, the second busiest airport in the world by passenger volume. The partnership is an agreement for both airports to promote the other in their home countries by collaborating in marketing, terminal management, airside management, route development commercial management and design. According to Randall, China spends more in tourism dollars in Loudoun County and the Washington, DC, region than any other country. Davis said the photo exhibit in a high-traffic area of Dulles Airport is a way of reciprocating what the Beijing delegation has done for Dulles and the Washington, DC, area. “Not only have they done it with us and for us, but now we have done it with them and for them. So we have a great relationship,” he said. He stressed that Loudoun County introduced the Beijing airport delegation to Washington, D.C., and that Loudoun was a platform for them to build that bilateral relationship.